Why did we stop by the pond in the cold? We wanted to to visit the caterpillars that were hiding in the cattails all winter. 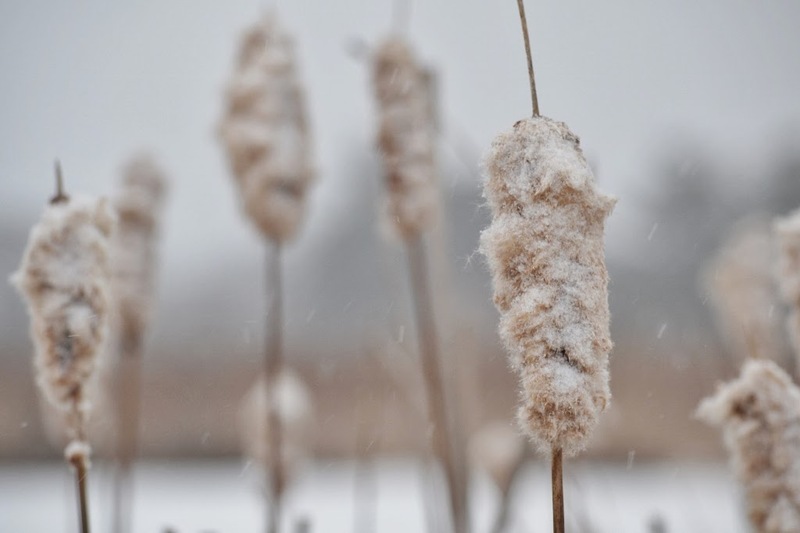 Cattail Moth caterpillars spend the cold winter hidden in the cattail fluff, and amazingly, those caterpillars remain unfrozen despite sub-zero temperatures. What we like to do with a cattail moth caterpillar is pull it from the fluff, and hold in our hand... seconds later it will start crawling around (see the video below). 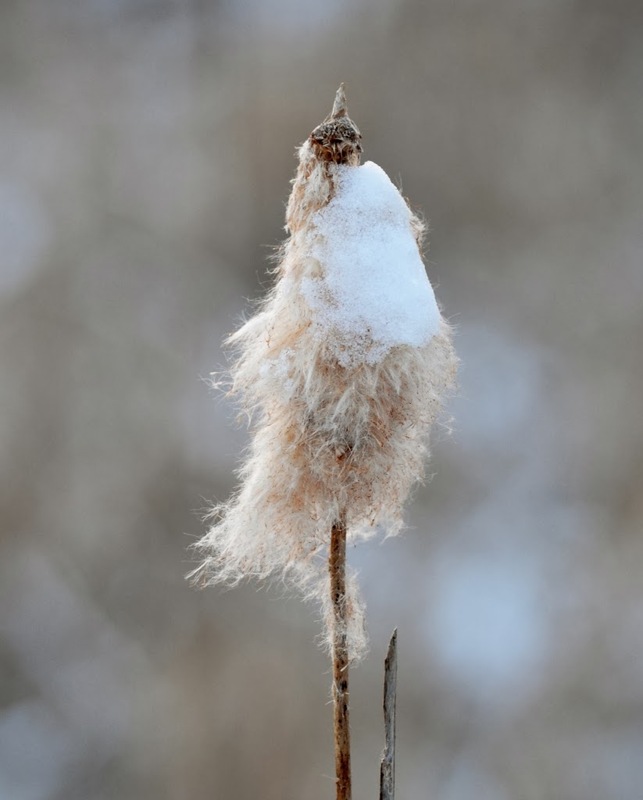 Some fluffy cattail seed spikes remain over the winter looking rather ragged and weather-beaten. 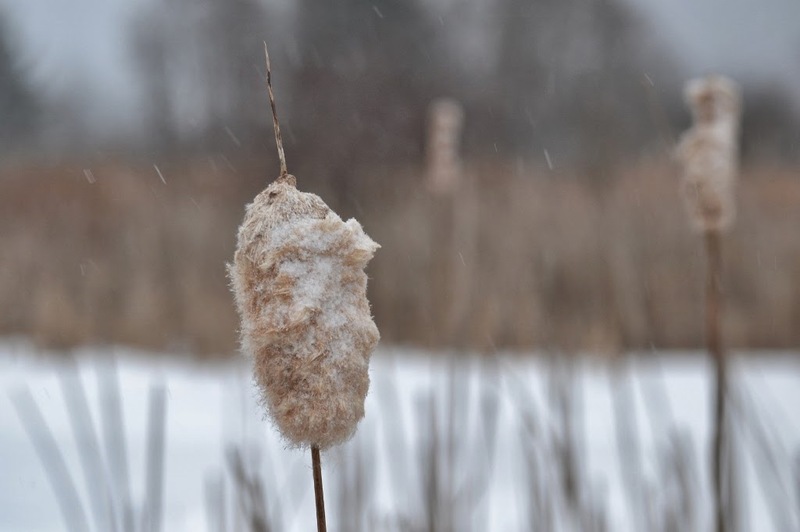 The cattail's fluff looks like this because the cattail moth caterpillars have sewn up the fluff with silk to hold their home in place. By gently tugging apart a cattail seed head, we find many of these cattail moth caterpillars. 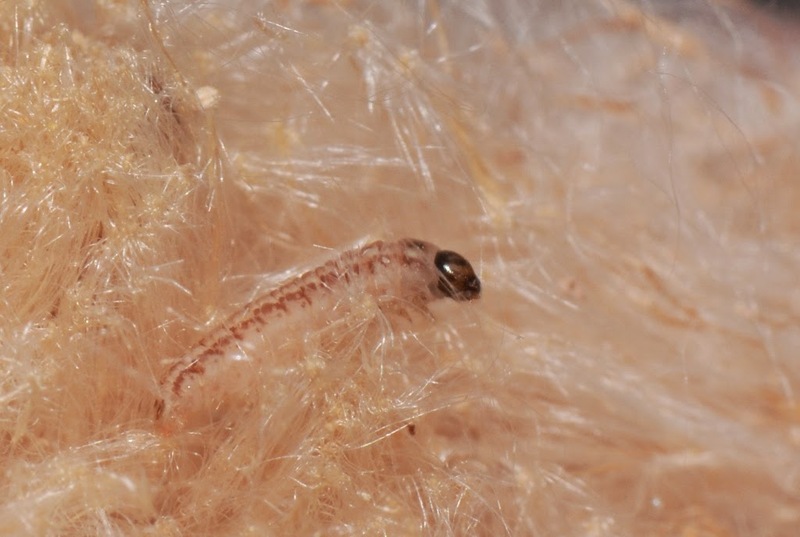 These small, white caterpillars with brown stripes and dark heads blend in well with the cattail down. Watch this video of a cattail moth caterpillar as it is pulled from its winter home and soon begins to crawl around on a warm hand. In this next video, watch as seconds after the caterpillar was removed from its winter abode, it began to crawl around, despite the fact that the overnight temperature was well below zero only a couple of hours before. You would think these caterpillars would be frozen solid, incapacitated, or even dead with how cold the winter has been. But, no, these caterpillars are designed to avoid freezing - and while they are at it, they help make a winter nature walk interesting. 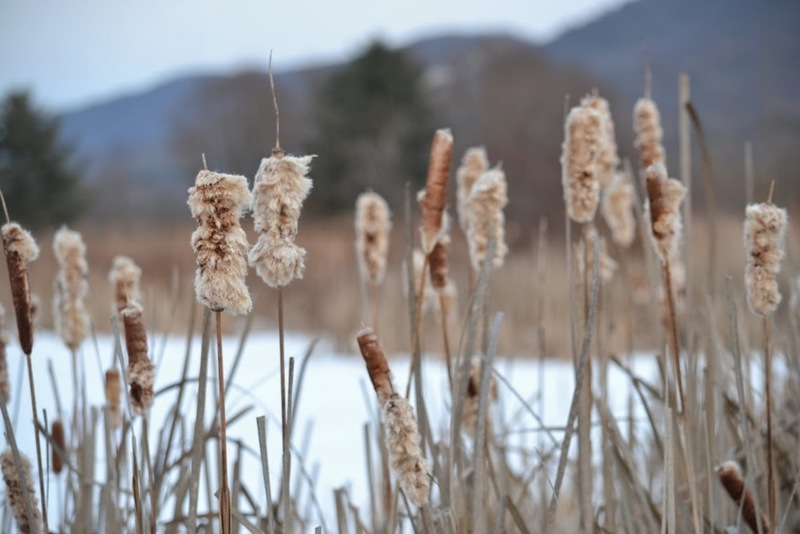 Cattails by the frozen pond during a cold, snowy winter hold a secret, don't they? A secret hidden under the snow-covered downy fluff. Yes, finding cattail moth caterpillars spending the winter hidden in the cattail fluff is one reason we stopped by the pond in the cold. 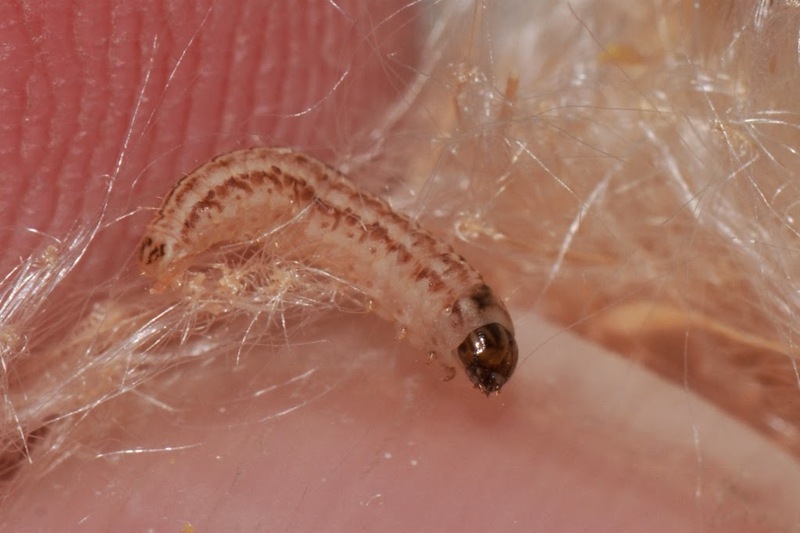 I posted about overwintering cattail moth caterpillars once before. So the cattails that still have the fluffy heads, are retaining their fluff coz of the caterpillar's "netting" ? How amazing. I hope you put that caterpillar back in his fluffy home so he/she could sleep through the rest of winter. Minus 7 F is mighty cold. Amazing. Thanks again Les. 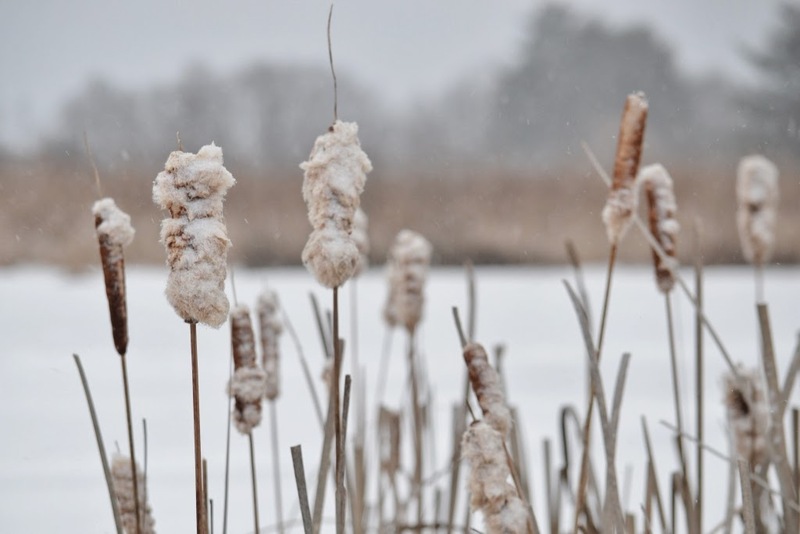 In the book, Swamp and Bog, John Eastman says on page 44 + 45, "Ragged or unkempt cattail spikes that remain on the stem into the following spring are common sights in any cattail patch. These frayed-out spikes hang on for a reason- they have been threaded throughout with silken, almost invisible, webbing ''tied'' into place. The tiers are caterpillars of the aforementioned cattail moth (Limnaecia phragmitella), which feed on the seeds over winter and, in spring, make cocoons in the dry fluff or in the stems." He also says, " Moth-infested spikes fluff out and generally ''droop'' from the stem, sagging like unkempt haymows; they look much grayer, more weatherbeaten, than the uninfested spikes."